Robotic sensors disguised as boulders, or ‘smart boulders’, have been used to measure the initiation and evolution of huge seafloor avalanches for the first time, revealing some surprising findings that will help inform where best to lay the seafloor cables that keep the internet running. Published this week in the journal Nature Communications, this research shows that submarine avalanches of rock and sand can travel across the seafloor at almost 30 km/hour (similar to a human sprinter), and are powerful enough to move objects weighing almost one tonne for several kilometres. Submarine sediment avalanches regularly damage global networks of seafloor telecommunication cables, but are notoriously difficult to directly measure due to their powerful nature. This multi-year project is the most ambitious attempt yet to measure these avalanches; a total of 15 events were successfully tracked, some of which travelled for over 50 km into the deep sea. 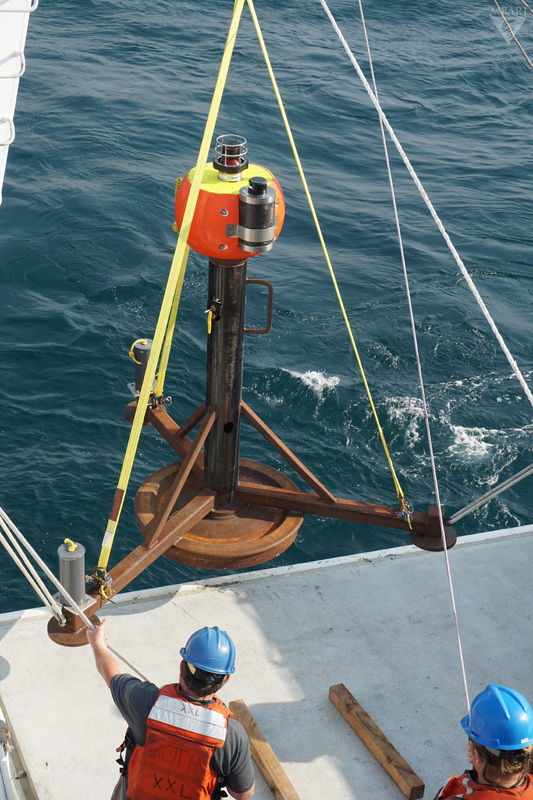 More than 50 instruments were installed on and above the seabed within Monterey Canyon offshore California, including novel smart boulders designed to travel within the avalanches and measure their speed and movement. One of these smart boulders was also attached to a heavy (800 kg) frame that was carried several kilometres down the canyon within a slurry of sand and rock fragments. The presence of such a dense sediment-rich layer at the base of the avalanche came as a surprise, and challenges many existing theories about how these flows behave. Repeated seafloor surveys made by robotic submarines revealed that the zone of seafloor affected by this powerful and dense layer was only limited to a thin central part of the submarine canyon. As flows travelled further to deeper water where the canyon was wider, they were also found to slow down. These new findings provide valuable information to identify safe crossing points across other canyons for new seafloor cables and pipelines. One of the other key findings of this 18-month, international, collaborative investigation, is that these powerful avalanches do not necessarily need a big event to trigger them. Dr Clare continued “If you think about snow avalanches, you can trigger one with a stick of dynamite dropped from a helicopter. On the other hand, if the conditions on the slope are just right, even a handclap up the valley could trigger one. Our research shows that submarine sediment avalanches are the same…they do not necessarily need a big trigger if the conditions are right. The new study forms part of the NOC’s research portfolio that aims to help protect people and property from marine hazards; it was funded by the David and Lucile Packard Foundation, and the Natural Environment Research Council (NERC). Dr Mike Clare was supported by the NERC “Environmental Risks to Infrastructure” Innovation Programme, which aims to better understand how natural hazards impact infrastructure and society. The field programme was led by Monterey Bay Aquarium Research Institute, supported by United States Geological Survey, Ocean University of China, Quindao National Laboratory for Marine Science and Technology, Durham University, Hull University, University of Southampton and National Oceanography Centre.